After a pretty rough Saturday recently, Sunday proved to be a much better day. I had nothing I needed to go out and do, so I let the kids lead the way for our morning. 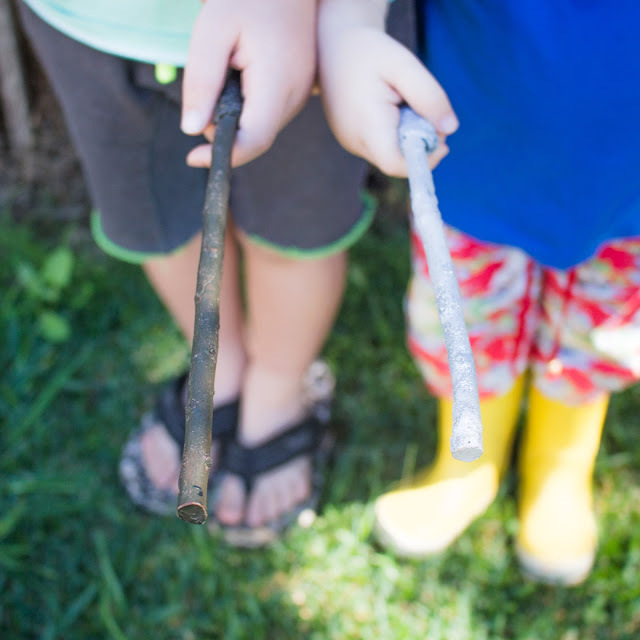 Turned out the bigger boy had been itching to make a magic wand for a few days. He is a big fan of Harry Potter and The Nowhere Boys, so last week was all about magic. This week is all about bats, but lets not go there right now. First sticks were collected. Then the iPad was consulted, and various how-to's found. We decided to simplify. Supplies were collected. Two sticks, trimmed with garden shears. Plastic plates for the paint. Brushes, string and hot glue. It's fairly straightforward, they didn't want a design that needed me to do everything, but I insisted on doing the hot glue gun work! I used a plastic tub lid to protect the dining table from stray hot glue blobs. 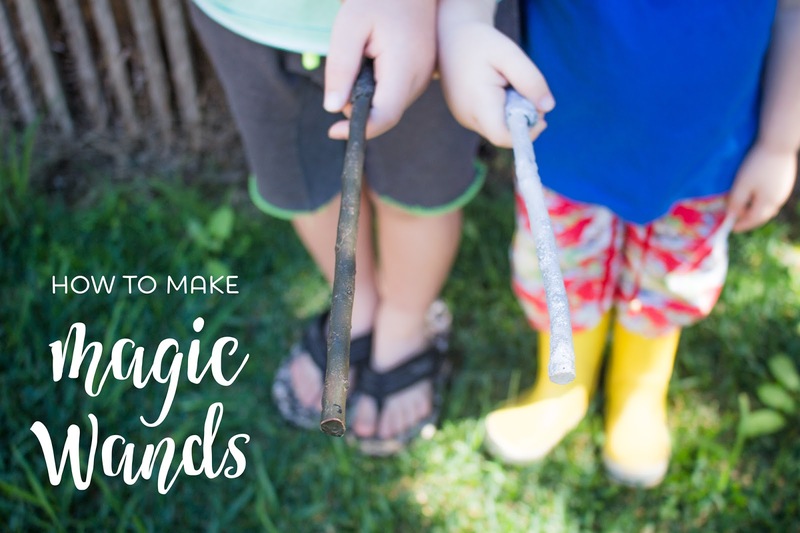 Run a little hot glue to get the string attached to the end of the stick, then run a line and inch long or so, wrap string, another line of glue, wrap string, and so on, until you have string securely wrapped around the handle end of the wand. I went back and added a blob of hot glue to the end of the wand to give it a rounded finish. In hindsight, we probably should have rounded the tips too. Next came the fun bit for the boys. Painting! The bigger wanted a Harry Potter style wand, very 'sticky' looking, so he opted for a dark brown. Good lesson in colour theory as we mixed that up from red blue and yellow. The littler wanted an abracadabra wand! Luckily we had a tube of silver paint (honestly my craft stash is not bad at all) which satisfied him perfectly. The finishing touch here was the fine silver glitter which we sprinkled over the tip of his wand, very magical! Coffee is a kind of magic. An amazingly chilled morning considering there was hot glue, paint and glitter involved. I love the wands. I can see so many great components to this project. And finally, prancing around the garden playing wizards while mum drinks coffee and hopes the play lasts longer than the craft. It was fun! And you'd be surprised how much play time those things have had. Bigger took his in to show the class, littler took his in twice! Littler has a 'Simon says' style game he plays with his wand. It goes like this: Abracadabra, be a tomato! *other child acts like a tomato* Abracadabra, be a frog! And so on. If you don't say Abracadabra the magic doesn't work and other child stays as a frog. Plus there's just the running around screaming game, but this time with wands.